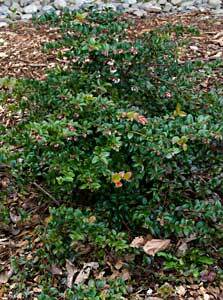 An erect bushy shrub to 8′ tall. Leathery, alternate dark green shiny leaves. 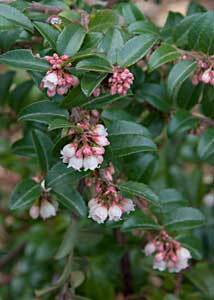 Pink flowers in spring with small edible purplish black berries in winter. Found in forest openings and beach fringes. Prefers organic soil in sun to shade. Commonly found along the west coast of the U.S.